Punjab Youth Internship Program is one of the special efforts made for development of youth which aims to provide 50,000 internships to students in Government departments. Launched by Govt. of Punjab, I personally believe it to be a good initiative because i have seen people struggling not only for job but for internship as well. Our industries and business sector is limited, offering limited seats for internees. 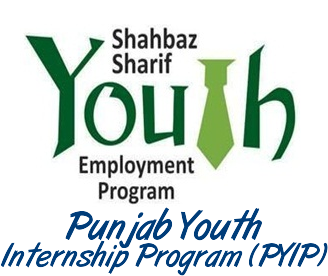 Punjab Youth Internship Program (PYIP) would not only facilitate students of HEC recognized institutes but also encourage them to begin with their professional career where they would get to develop, enhance and learn the skills in order to practically enter in the professional world as an employee. Students who have completed their 16 years of education from HEC recognized public/private university, are eligible for applying for internship under Punjab Youth Internship Program (PYIP). The duration of internship program would be 3 months in total and monthly stipend of Rs. 10,000 would be given to the students. I am glad about this fact of stipend, which is a good amount to at least bear monthly travelling and few other minor expenses.Because in private sector, students not get to receive stipend at all. It would keep the interns motivated. Students would be given certificates at the end of their internships under Punjab Youth Internship Program (PYIP) and their performance would be evaluated closely by the respective organizations/departments they are working in. It has been declared clearly that i would not lead to further job in the same organization. Its only an internship, so students should not build hopes of getting associated to the organization as an employee on the bases of their internship performance. To get job in Govt. dep./org., the formal procedure is followed. Overall i rate this program very good because it is really a productive opportunity for students who need such initiative badly after completing their studies. It would boost their energies and can play vital role in brightening their future. Students can apply through rozee.pk. Online application is encouraged to make the procedure quick and prompt. For official webpage of Punjab Youth Internship Program (PYIP) click here.